Front view of house from the water. Dining room with den beyond. 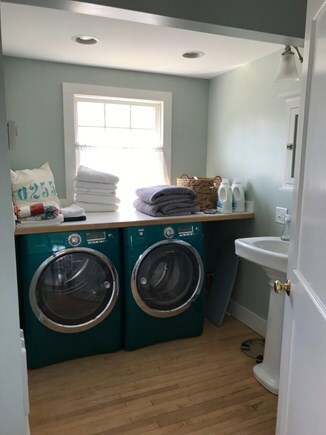 Laundry and half bath. Outdoor shower just outside on back porch. 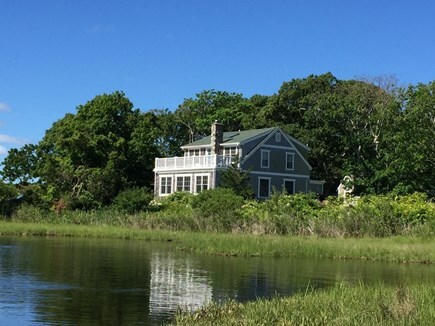 Come home to this lovely four-bedroom shingled waterfront Cape on a quiet dirt road that skirts the coastal Farm Pond, a beach-barrier away from Nantucket Sound. 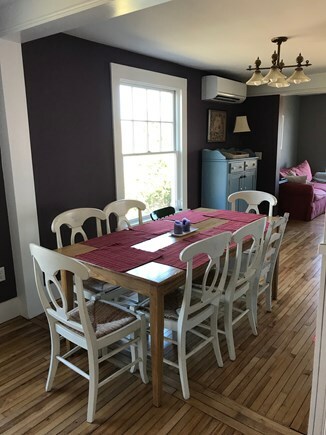 This 1900 vintage cottage (expanded and renovated in 2009, kitchen remodeled in 2017, central heat/air installed 2019) is located in historic Oak Bluffs, near the center of town but away from the crowds. We are within walking distance of the Camp Meeting Association Gingerbread Cottages and the heart of the Vineyard's art district. Have the best of it all: walk to town, beach, nature trails, tennis, bike paths, Ocean Park and the summer Oak Bluffs ferry. Or hop on the Vineyard Transit bus that leaves Ocean Park for all points, including down Beach Road in front of our house to State Beaches and Edgartown. We are close to everything yet quiet. 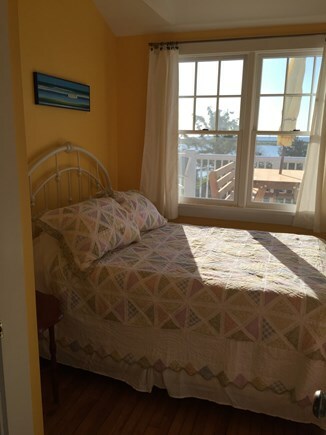 Peaceful water views from almost every room with a glorious, spacious upstairs porch. The house has an open, light feel inside with lots of windows, skylights while still feeling cozy and inviting. The first floor circles around the main staircase. Just inside the front door, enjoy the living room with a custom Lew French beachstone fireplace, a window seat, bookshelves and comfortable seating. Just beyond there is a small den with a TV and further on the dining room with table for 6 or 8. 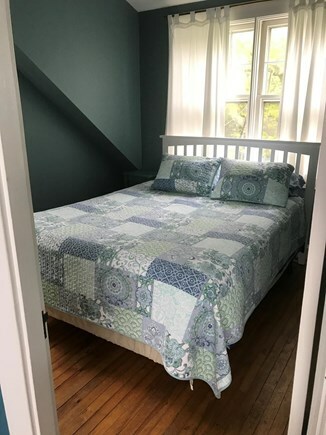 Pass the laundry and half-bath into a lovely, fully equipped kitchen looking over the back deck, with quality appliances, a drop-leaf antique table, and a cozy arm chair for cook's company. The back door out of the kitchen gives onto the spacious back deck, with rockers and built in benches, perfect for morning coffee, looking out at the water. The newly installed enclosed outdoor shower is also on the deck. Back inside, circle around again to the living room and stairs to the second floor. 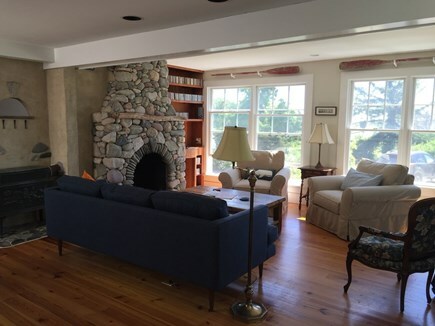 Upstairs in each corner are 4 bedrooms (2 queens, 1 double, 1 with double-below/twin-above bunk) with vaulted ceilings, a landing with a large skylight, and French doors that open to a full, wide front deck with spectacular 270-degree views of water and the surrounding landscape. 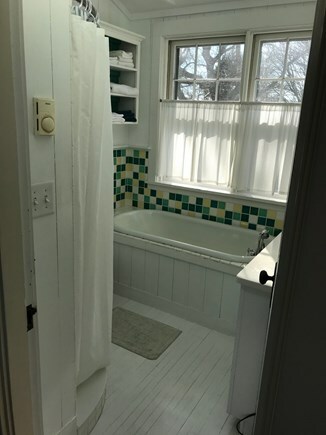 Also the full bath with tub and separate tiled shower is on the 2nd floor. Additional availability info: Weekly rentals must begin and end on Saturdays only in July and August. This is a Saturday to Saturday vacation rental. Long-Term Rental (1 month or more): Monthly rentals off-season (November, January, February, March, April) considered. $1100/month plus utilities or $1500 inclusive. Additional pricing info: A $250 cleaning fee will be added. If approved there is an additional pet fee of $300/pet, State and local taxes of 11.7% will apply. 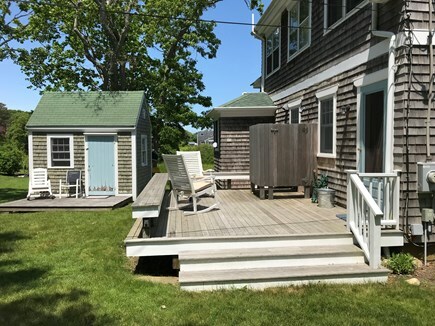 Truly best location in Oak Bluffs - easy to walk to the action, yet peaceful and quiet at the house. Huge windows on the first floor, and large second floor deck. Gorgeous views everywhere you look. The house was thoughtfully decorated, comfortable, well supplied with high quality linens, dinner and cookware, bluetooth stereo, kayaks, and air conditioners for each bedroom. The owners were helpful and thoughtful. House was great. We loved reading during the day and having drinks at night on the awesome roof deck. 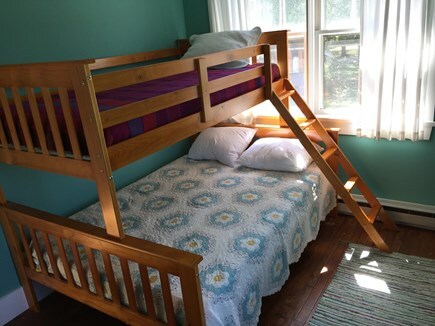 Bunk beds were great for kids and plenty of room in the house. We used the bikes and it was a short easy walk down town (0.5 miles). Also short bike ride / run to jaws bridge (2.8 miles). If available we would definitely stay here again. We are a couple who live in Nashville, TN where we both teach at Vanderbilt. 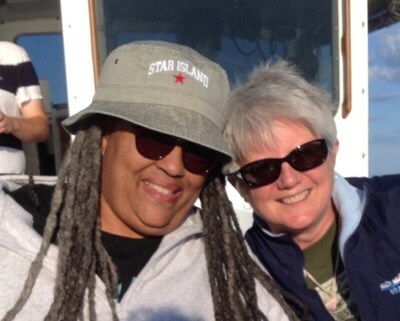 We have year-round family on Martha's Vineyard and we have been visiting the island for years. We love Oak Bluffs for its quirky charm and its important history. This is our dream home, and we look forward to retiring here. 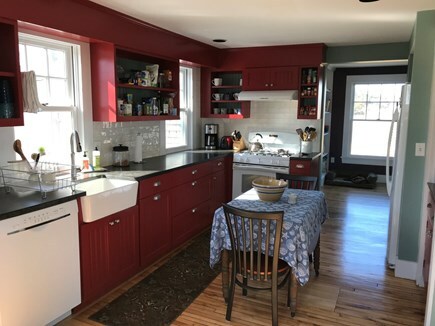 We purchased it several years ago from artist-owners who have lovingly lived in (and renovated) the house over the past 3 decades, and we have added our own improvements. We stay here as much as we can, and make it available to rent when we cannot be here. 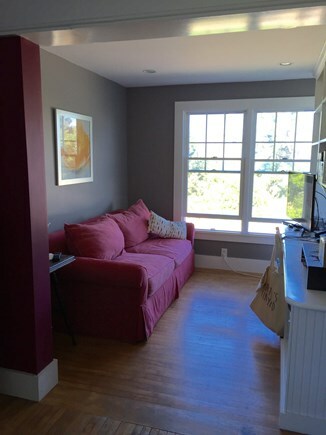 We have had four years of happy renters, though this is our first time listing with this site (having heard good things about renters who use it from neighbors!). We bought this house for its stunning location and internal beauty, its proximity to historic town and beach, and its structural soundness. It was built in 1900, remodeled and expanded in 2009. We just upgraded the kitchen with custom cabinets and countertops, and installed year-round central heat and AC. It's a special place. We love Oak Bluffs for its community, its special black history, and its charm. 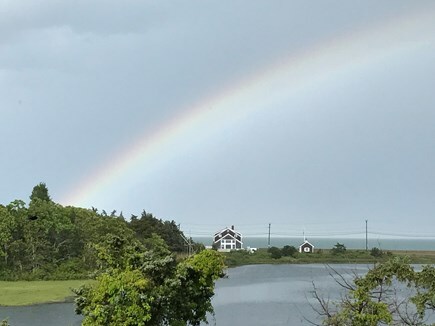 In the morning, you can walk out the front door, along the pond, and a block down Canonicus Street to the beach along Nantucket Sound. Walk along the water all the way around to the harbor, and end up at Biscuits restaurant for breakfast, then walk back through the Camp Ground, full of brightly-painted Victorian cottages. Ride bikes to the fantastic bike path toward Edgartown, with water and beaches on both sides. Or walk along the pond on the Land Bank trail and see the many varieties of waterfowl, including Great Blue Heron, Osprey, Bufflehead ducks, and a (very) occasional otter. Try clamming, if you have the gear! We feel this is the absolute best location on the Vineyard. We're a block from the best bike path on the Island. There are gorgeous walks in every direction, and you can kayak on the pond right out in front of the house. Some great fishing locations are within sight of the house. 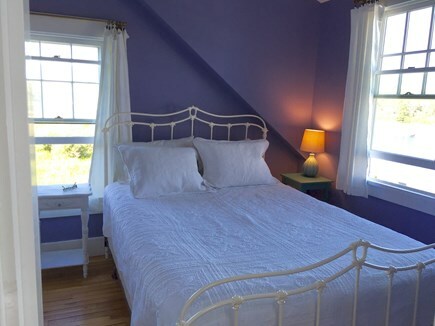 It's a very short walk to town, the harbor, restaurants (check out Sweet Life for a special occasion), galleries (we like Cousen Rose, Featherstone, and Alison Shaw). There's a grocery store, drug store, banks, post office, and everything you need. 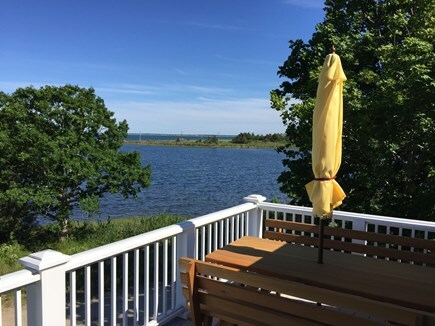 Cap off your day with cocktails on the huge upstairs deck overlooking Farm Pond and Nantucket Sound. You can see water from nearly every room in the house.